Picture this: You're standing in a room, it's a sea of people, you notice an attractive person that you would certainly like to "know" better. You start walking towards them, you have a laser focus, you are going to start this conversation if it's the last thing you ever- you know, I should probably go walk over here instead. Yeah, that's a better idea. Far, far away from them. Over here. 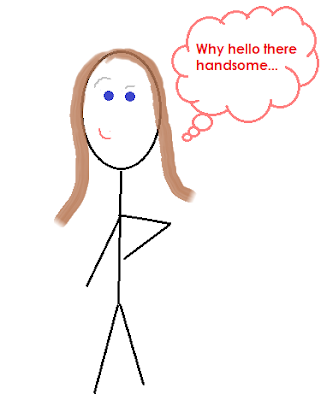 I think good looking guys have a five foot force field (alliteration prize!) around them that completely obliterates my nerve. I had set a (sort-of) New Years resolution to flirt more this year, and so far all I have done is chicken out more frequently. So yeah, you could say that things are going really well. Step one: Notice an attractive man on the other side of the crowded room. Initial reaction is one of determination with a slight edge of confidence. I'm gonna go talk to this boy so good! He's not gonna know what hit him. Oh yeah, I've got this in the bag. Commence walking towards him. Step two: Mind begins to fill with doubt and fear. With every step I become increasingly self aware, what if I only talk to him sorta good? Every possible bad outcome has begun to swirl around in my head. What if I sneeze as soon as I walk up and he's a germ-a-phobe and freaks out and accidentally punches a baby while I cry tears of apology? This is going to be disastrous, I just know it. Step three: Run away! Far, far away! I wonder if this how guys feel when then want to go talk to a girl? It can't be as bad as it is in a woman's brain, it just can't be. 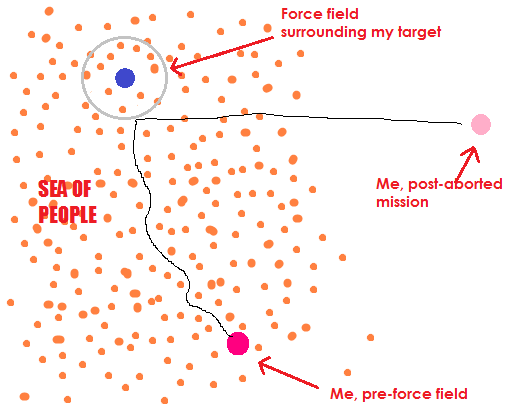 Maybe my real problem is that I need a better game plan of what to say if I ever make it past the force field. "Hi. Your face is nice." "My body's chemistry seems to be responding well to your body's chemistry." Oh dear, no not that. "Whattaya say we ditch this popsicle stand and go see if Krispy Kreme is still open?" Oh yeah, that one is money. I should write a book of pick up lines. Maybe instead while I'm shuffling past them in the crowded room I'll slip my phone number in their pocket with a note that says "Call me, I am a ninja. You know it's true because you didn't feel me put this in your pocket." Ladies and gentlemen, I think we've found ourselves a solution. Wow...very nice blog my friend! Much better than mine is! Time spent on boys is not wasted! 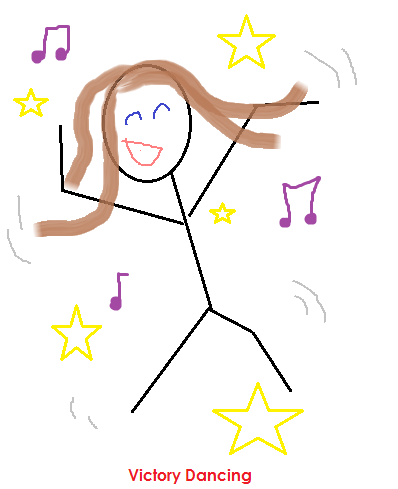 Anon- I'm happy that you think the stick figures are cool, I have fun with them. I do write about other things too (http://bit.ly/zNK0jV, http://bit.ly/A7FkSe, http://bit.ly/xgW6TD) I've just found that dating posts are enjoyed the most and are most related to by my readers. Don't worry too much about me sounding desperate, I think people know I'm just having fun with it :). NINJA! I love it! That is what I was missing all along...I should be a freaking ninja! It's all about numbers, the more you do it, the better you get.... Nobody is great at approaching initially, it takes 6 months of pure humiliation to develop the cool required to always be impressive with a first time acquaintance. It's just like being a stand-up comedian, you are going to have a lot of nights where people look at you like you just emerged from a factory of weird. Just gotta work through that and know you are funny. Just walk up and know at the least, you are interesting. Stay away from ninja tendencies, ice breaking one-liners that you actually fall through the ice with....and drown, and last but not least, the reek of desperation. Use your eyes, li-trally look, and if they look back, there is your chance. And if you must use a line, you should use the greatest line of all time, " Hi, what's your name?" Interestingly enough, women initiate 3/4 of all flirting, chances are you are doing it already, you just aren't very good at it. :) You are a salesman (pardon me, saleswoman) either you are going to sell him on you, or he is going to sell you on no. After you get through the 6 months of soul crushing, yes soul crushing, humiliation, you will realize that there is a script involved, and it generally goes the same every time. When you get good at the script you can improvise, and let that slightly awkward creativity shine through. Lucky for you I have written down these pearls in response to your blog, therefore saving you the time and effort required to copy it down in your unicorn covered dating journal. Alright, how the heck did you find out about my unicorn covered dating journal? 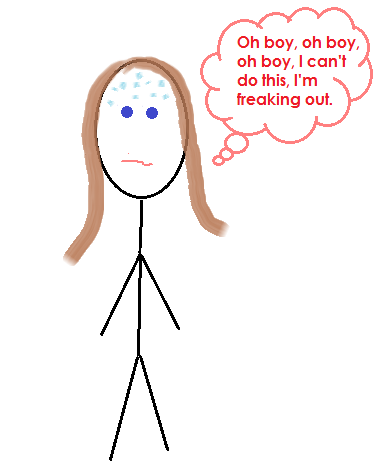 The Thoughts of Melly J.
jimlivesinamuffin | #1 blog for people who want to know what happens when you live in a muffin.